This week is key for Wall Street, with highly anticipated third-quarter earnings of major companies due. (CNN) -- A diverse collection of earnings and government reports will again put the economy at center stage this week, as investors wonder whether the Dow will get comfortable again above the 10,000 mark. Consider the mix of companies due to add to the debate about whether a recovery is taking root: Apple, Microsoft, Coca-Cola, Wells Fargo, Pfizer, United Health, Yahoo!, AT&T, Delta Air Lines and Merck. And from the government: the Labor Department's Producer Price Index (inflation), the Commerce Department's new housing starts report and the Fed's Beige Book -- its summary of economic conditions region by region. The markets will be in the news in other ways, as well. Those tracking relatively recent history will note it was this week in 1987 that saw a shocking market crash. 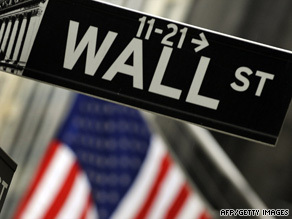 The Dow Jones industrial average lost 508 points; that was 22.6 percent of its value. October 19, 1987, became known as Black Monday. The House Financial Services Committee will be looking to the future, holding a hearing Tuesday on proposed regulatory reforms. Adding heat to that debate, top White House officials railed Sunday against Wall Street interests it said were lobbying forcefully against new regulations. The administration says the new regulations will help protect against the abuses that contributed to the 2008 financial crisis. White House Chief of Staff Rahm Emanuel told "State of the Union" on Sunday: "As soon as stability was achieved, and things had a sense of normalcy, what is it some of the titans of the financial [industry] do? They're literally going and fighting the very type of regulations and reforms that are necessary to prevent, again, a crisis like this happening." • The road ahead in Iraq is on the White House agenda as the work week begins. Iraqi Prime Minister Nuri al-Maliki will be at the White House for meetings with Vice President Biden. Administration officials are voicing confidence they can keep their timetable for drawing down U.S. troops but are frustrated that Iraq lags in some reconciliation steps the White House views as critical to lasting stability. • Another war council meeting is on tap as the president moves closer to a decision on Afghanistan troop levels. But closer doesn't meant an imminent announcement; the administration is urging President Hamid Karzai to negotiate a power-sharing agreement with his chief campaign rival. The White House is also making it known that the president believes any decision on U.S. troops must wait until the Afghan political situation is clear. Emanuel said it would be "reckless" to make a decision on troop levels until the administration knows more about its "Afghan partner." Senate Foreign Relations Committee Chairman John Kerry backed that view up during an Afghanistan-Pakistan trip that included several attempts to nudge Karzai along. "Entirely irresponsible," was Kerry's characterization of what it would mean to decide U.S. troop levels before the Afghan election dispute was resolved. • Gen. David Petreaus is scheduled to meet with Pakistani officials; his assessment of the ongoing Pakistani offensive against al Qaeda and the Taliban will factor into the Afghanistan decisions. • The health-care negotiations pick back up on Capitol Hill. • Climate change, the H1N1 flu, the Patriot Act and election reforms are among the topics for a busy week of congressional hearings.